Morning sun and afternoon storms--that sums up the forecast into next week. While no days will wash out, summer storms are dangerous with downpours and frequent lightning, so take a break from your outdoor plans should a storm fire up nearby. Today and Tonight: Friday’s highs will make it into the lower 90s prior to another round of scattered afternoon showers and thunderstorms. 60 percent of the forecast area will see some rain and storms will be capable of a fast inch or two of rain and possibly gusty wind. Overnight, look for partly cloudy skies up top and lows in the mid 70s down low. Up Next: A similar setup will be in place through early next week, with scattered showers and thunderstorms popping off in the afternoon hours. The added action will lead to shorter duration heat, but high temperatures will still top out near average in the low 90s. Nights will be quieter, with low temperatures in the low to mid 70s. Toward the end of the 7-Day Forecast, a cold front will be in the region, but it is not yet clear how far south this boundary will go. 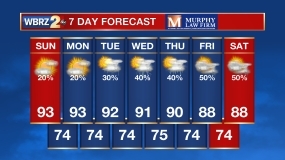 Should it clear the Louisiana Coast, we could feel some lower humidity to wrap up the week. 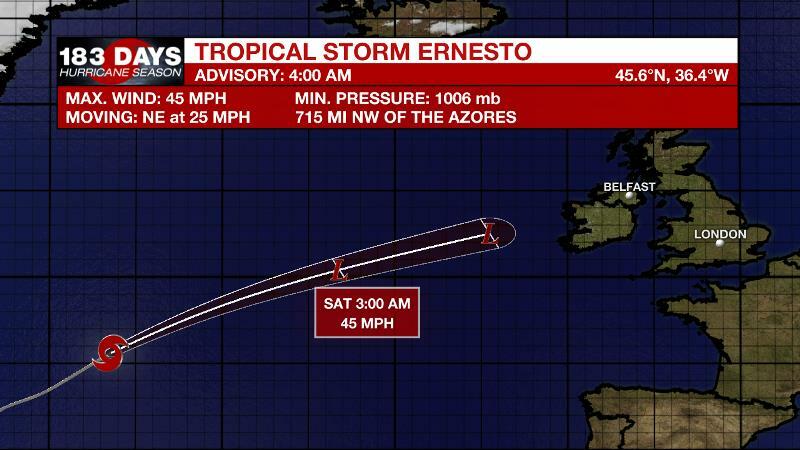 The Tropics: Tropical Storm Ernesto is racing off to the northeast in the open North Atlantic with 45mph winds. This system poses no threat to North America and will merge with a front near the United Kingdom over the weekend. Much farther south, a disturbance east of the Windward Islands is given a 20 percent chance of development over the next 5 days before it encounters harsh conditions in the western Caribbean Sea. A 500mb trough will deepen over the Southeastern U.S. through the weekend. This will create plenty of instability for scattered showers and thunderstorms to erupt on their normal diurnal schedule. For the latter half of the extended forecast, forecast models are now indicating that another shortwave trough in the upper level flow will dig into the main eastern trough, deepening it, and even sending a cold front southward toward the Gulf Coast. It is too early to tell if this front will clear the area, but if it does, lower dew points may be expected for a few days following causing it to feel a bit more comfortable. Through at least Wednesday though, expect highs and lows near average with plenty of humidity as well as scattered afternoon showers and thunderstorms. High precipitable water will be maintained leaving in the threat for locally heavy rain.